Plans for a five-pitch travellers' transit site in Denbighshire face a delay of at least two years. Some 4,000 people signed a petition against proposals for Greengates Farm on the outskirts of St Asaph. County council leaders will now look for another location as part of the local development plan (LDP) process. A six-pitch site at the farm for a family which has lived in the county for some years will go to the planning committee for a final decision. Denbighshire began its search for suitable sites in 2017. The Housing (Wales) Act 2014 requires councils to provide sites if a local need has been identified. The proposed transit site, to provide five pitches for families travelling through the county, has provoked a huge public reaction, according to the Local Democracy Reporting Service. Councillor Peter Scott, who represents St Asaph West, said it was a "very dark day" for residents and businesses last September when they learned Greengates Farm was the preferred option. He said people were worried about "community cohesion, loss of amenity and risks to local businesses". 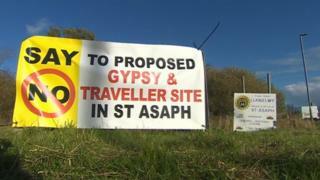 Mr Scott claimed it would be a "catastrophe to the jewel in the crown of the St Asaph Business Park". Other members felt that the issue needed to be looked at in more depth, preferring a final decision on the site to be made by the full council as part of its LDP. Richard Mainon, who represents Bodelwyddan, said the council owed residents "the best piece of work we could possibly do". "I know through the new LDP process we will have all concrete proof over what is the right thing to do," he said. The next round of the local development plan will not be decided until 2021. Cabinet members agreed not to recommend Greengates Farm for transit accommodation.